Three Massachusetts combat veterans have won a court challenge against the state government, which denied them their Welcome Home Bonus money after deployments in Afghanistan because they received “other than honorable” discharges from the military. Lawyers in the case estimate the Suffolk Superior Court judge’s decision could affect about 4,000 veterans in Massachusetts, while two of the plaintiffs said they hope it will also draw more attention to the plight of former service members, including those with post-traumatic stress disorder, who struggle with resuming their lives after returning home. The Welcome Home Bonus was created by the state Legislature in 2005 to reward the service of veterans following the Sept. 11 terror attacks. Bonuses can be up to $1,000 per enlistment, depending on where they served. The plaintiffs in the case — Jeffrey Machado of Exeter, N.H., and Herik Espinosa of Lynn, along with Santos — are Army veterans who served deployments in Afghanistan, completed enlistments with honorable discharges, and re-joined the service. But each plaintiff completed his Army career with an “other than honorable” discharge from his final enlistment. All three plaintiffs were diagnosed with post-traumatic stress disorder related to their deployments, and the Department of Veterans Affairs has deemed them service-connected disabled veterans, their lawyers said in a statement. A “bad-paper” discharge can be the result of minor infractions of military law, substance abuse, and other forms of misconduct, according to the statement. More than 135,000 post-9/11 veterans have received such discharges, it said. In a Dec. 21 decision, Associate Justice Michael Ricciuti called the state government’s interpretation of the bonus law “erroneous as a matter of law, arbitrary and capricious.” The judge ordered the state government to reconsider its decision in light of his ruling. Dana Montalto, one of the attorneys who represented the veterans, praised the ruling and said she hoped it would draw more attention to the bonus program and the needs of veterans. Montalto, a clinical instructor with the Veterans Legal Clinic at Harvard Law School’s Legal Services Center, was part of the team of attorneys that filed the lawsuit in 2016 on behalf of the three plaintiffs. State Treasurer Deborah Goldberg oversees the bonus program, and her office, along with the state Veterans’ Bonus Appeal Board, denied the plaintiffs’ applications for the bonus money due to their discharge status. The state treasurer’s office is currently reviewing the decision, said Chandra Allard, an agency spokeswoman. Goldberg has 60 days to appeal the decision, Montalto said. Veterans with “bad-paper” discharges are more apt to enter the criminal justice system, battle addiction, face homelessness, and have mental-health issues that go untreated, said Kristofer Goldsmith, assistant director for policy and government affairs for Vietnam Veterans of America. They also are more likely to commit suicide, said Goldsmith, an Iraq War veteran who received an “other than honorable” discharge from the military. He said the Massachusetts court ruling follows Connecticut, which last month opened up its state Veterans Affairs resources to those with “other than honorable” discharges, he said. “For a state to recognize service in this way is incredibly significant,” Goldsmith said of the ruling. Santos, a 38-year-old Somerville native, served from 2004 to 2012 and rose to the rank of staff sergeant. But his military career ended with an “other than honorable” discharge after he said he violated Army rules to visit his then-fiancee in the Philippines. That relationship ended and he returned to Massachusetts in 2012, but Santos’s discharge status made it difficult to find work and take care of his two teenage children from a previous relationship, he said. He applied for Welcome Home bonuses covering his deployments so he’d have the money to hire an attorney to help upgrade his discharge status to make it easier to find a job, he said. Santos has since married, and he and his wife are expecting a child. Machado, 32, a Salem native who served from 2011 to 2014, said his service-related PTSD resulted in a 2014 incident with his then-wife, in which he tried to drive their car off the road in Hawaii. She tried to take control of the car, and Machado grabbed her by the throat, he said. Charges in that case were dismissed, but the incident led to a no-contact order from the military, which he violated twice. He was ultimately discharged from the Army, he said. 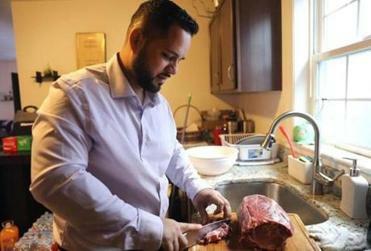 He struggled with homelessness after leaving the military, then returned to his family in Massachusetts before moving to New Hampshire. He remains proud of his Army service but being refused bonus money was like being told veterans like him had not served with honor, he said. “At the end of the day, the honor of serving . . . outweighs any benefit, any amount of money, that they have to give to us,” Machado said. Espinosa declined to comment through Montalto. The appeals board had argued that a veteran with an “other than honorable” discharge was ineligible for the bonus, even if that veteran completed prior enlistments honorably, according to Ricciuti. The board’s decision-making relied on its own reading of a specific final discharge document issued to veterans who leave the service, Ricciuti wrote. The attorney general’s office, which represented the state in the case, argued that the board’s own interpretation of that document was the “final word” on whether a veteran was honorably discharged, Ricciuti wrote. The judge said the board’s reading of the law conflicted with the statute, which he said is intended to reward veterans for each enlistment they completed. He criticized state officials’ handling of the plaintiffs’ bonus applications and wrote that the state acknowledged the board sometimes also used other documentation of a completed enlistment to determine eligibility for the bonus. “The Board’s concession that other military forms can substitute for the [discharge document] demonstrates that insistence on that form in these cases was arbitrary and capricious,” he wrote. The court decision is a step in the right direction, but many veterans still struggle, Santos said.